It has been a long time coming but here is a new post! I am grateful to all the people who helped me to come back from my illness. I learned quite a bit from this experience. The thing I want to share that is most valuable to me is that each moment is precious. You won't have the resources in life to do everything so make what you choose to do count! I choose to spend more time with people I love, cooking nutritious food, serving others, and of course, quilting. So, in fulfilling two of the above goals, I have invited a couple of friends, Julia and Karen, to learn to use my quilting machine. We have had great times together and they are both now accomplished quilters! It has been so fun each week to see what they are working on and be inspired. This is one of Julia's modern quilts. I love it because it is so colorful! The bright scrappy colors feel so happy. She found the pattern here: Granny Square Quilt Pattern. Julia made some changes that make it more modern I think. She added corner stones to her sashing and eliminated the border. The corner stones are the same width as the sashing in both dimensions. The sashing strips on all sides are the same length as the squares are. 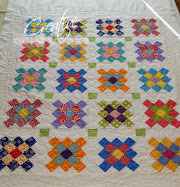 Here are a few more links to Granny Square Quilts. This one has lots of food for thought and ideas of different layouts. At this link, Giant Granny Square Block, Darcy makes 19 inch plus squares. She has instructions to make it from individual squares and clear instructions on trimming your finished squares. This link, Another Granny Tutorial, uses all different squares in her granny squares and she has another link at the bottom of the page using jelly roll strips. Branching out a little bit more are these links here: Moda Bake shop blueberry and here: Moda bake shop colorful. These links have different colorways and more rings. Here is to choosing well how you spend your time! Have fun with Granny Square Quilts! So fun and bright! So glad you are feeling better!! Love you!